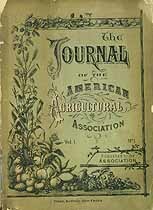 The Journal of The American Agricultural Association, Vol. 1, No. 1. Joseph H. Reall, Secretary and Editor. 127 Water Street, New York. Names in this online transcription include Achelis, Adams, Aiken, Alcorn, Allen, Alvord, Ammen, Amory, Amsdell, Andrews, Apperson, Armstrong, Arnold, Aspinwall, Atherton, Atkinson, Atwater, Atwood, Aultman, Bailey, Baker, Baldwin, Barney, Barrett, Bateham, Bates, Battle, Beadle, Beebe, Beirne, Benham, Bennett, Beverly, Bishop, Bissell, Blanchard, Blight, Bodwell, Boucher, Brackett, Brady, Branch, Breing, Brewer, Bristol, Brown, Buckingham, Buckley, Burchard, Burdett, Burtnett, Bush, Butler, Butterworth, Byrnes, Campbell, Carey, Carmen, Carpenter, Chambers, Cheever, Claiborne, Clark, Clay, Clayton, Cleeman, Clough, Clute, Coffin, Coleman, Collier, Colman, Comstock, Conover, Copeland, Crane, Crawford, Curlett, Curtis, Daggy, Dana, Danforth, Darlington, Davis, De Graff, De Mott, Dean, Dederick, Derby, Dewey, Dikeman, Dodge, Doty, Drennen, Drew, Drummond, Dudley, Duncan, Duncombe, Dunnington, Dusenbury, Eagle, Eddy, Elliott, Ellsworth, Emerson, Emery, Evatt, Failer, Fairlamb, Fink, Fisher, Flint, Foreman, Foster, Fowler, Frame, Francis, Freeman, French, Fulford, Fuller, Fulton, Furnas, Galt, Gardner, Garland, Gatchell, Gentry, Gilbert, Gillett, Glass, Goessman, Goodale, Gordon, Graves, Gregory, Gridley, Grinnell, Hadmen, Haines, Haldeman, Hall, Hammond, Harrington, Harris, Havemeyer, Havens, Hayden, Hayes, Hazard, Hazen, Heath, Hegeman, Hegewich, Heide, Henderson, Henry, Hexemer, Hill, Holloway, Holmdale, Holt, Holtze, Hoskinson, Howlden, Hubbard, Hudson, Hulick, Humphrey, Hunter, Hurlbut, Hyde, Ingals, Ingram, Jackson, Jennings, Johnson, Jones, Kalb, Keith, Kenerson, Kennedy, King, Kinney, Landreth, Lane, Lapham, Law, Lawford, Lawrence, Ledoux, Lees, Leighton, Lester, Lewis, Liautard, Libby, Lobdel, Lobdell, Locke, Lorentzen, Loring, Lynn, Lyon, Mabry, Macey, Malone, Manley, Markham, Mason, Mathews, Mayer, McAlexander, McAllister, McCarty, McComb, McConkley, McDonald, McDowell, McFarland, McGlincey, McHenry, McIntyre, McKean, McLaren, McLean, McPherson, Mead, Meem, Menier, Mercier, Merryman, Miles, Milk, Miller, Mills, Minkler, Monecado, Montgomery, Moran, Morris, Moulton, Mozley, Mudge, Mumford, Munson, Murphy, Murray, Nathurst, Needham, Neilson, Newhall, Nobles, Northrip, Noyes, Nuckalls, Nungesson, Ochme, Owen, Page, Parcell, Parker, Parsons, Partridge, Patterson, Patton, Payne, Pearce, Peddie, Peffer, Pennington, Perkins, Perry, Phinney, Pierce, Piper, Pittman, Polk, Pope, Potter, Powell, Price, Randall, Randolph, Rasin, Rathbone, Reall, Redfield, Remington, Renwick, Richardson, Ricker, Ridgeley, Riley, Roberts, Robins, Robinson, Root, Roots, Ross, Rue, Rupp, Rutherford, Ryerson, Salisbury, Scott, Scoville, Sedgewick, Seiler, Sellers, Seymour, Shaffer, Shattuck, Shether, Shinn, Shipman, Simmons, Simpson, Slade, Slater, Smith, Smyth, Sneath, Snevely, Snow, Sprague, Squire, Stearns, Steele, Stevens, Stewart, Stillwell, Stoddard, Stoebler, Storrs, Stuyvesant, Sutherland, Swallow, Taggart, Talbot, Talcott, Taylor, Tayor, Tenbroeck, Thomas, Thompson, Thurber, Tichnor, Toombs, Torbert, Townsend, Trainer, Tremain, Trowbridge, Turner, Underwood, Vail, Valentine, Ward, Warder, Waring, Watson, Weed, Welis, Wells, Weltz, Wheeler, Whipple, Whitaker, White, Whitehead, Whitman, Whitney, Wilder, Wildman, Willard, Williams, Williamson, Willis, Wilson, Winslow, Wiselogel, Wolcott, Wood, Woodmansee, Woodward, Wylly, Young. This page features a historical book or original document that was transcribed during 2007 as part of the Genealogy Today Subscription Data collection -- a project focused on capturing details about the lives of your ancestors, from their early years in school, through college and then into their careers, hobbies and group activities. The list of family names above represents unique last names of individuals found in these American Agricultural Association records. The Genealogy Today catalog number for this item is 13675. When inquiring about the information in this resource, please mention the catalog number.